T cell expression of class II MHC/peptide complexes may be important for maintenance of peripheral self-tolerance, but mechanisms underlying the genesis of class II MHC glycoproteins on T cells are not well resolved. T cell APC (T-APC) used herein were transformed IL-2-dependent clones that constitutively synthesized class II MHC glycoproteins. When pulsed with myelin basic protein (MBP) and injected into Lewis rats, these T-APC reduced the severity of experimental autoimmune encephalomyelitis, whereas unpulsed T-APC were without activity. Normal MBP-reactive clones cultured without APC did not express class II MHC even when activated with mitogens and exposed to IFN-γ. However, during a 4-h culture with T-APC or macrophage APC, recognition of MBP or mitogenic activation of responder T cells elicited high levels of I-A and I-E expression on responders. Acquisition of class II MHC glycoproteins by responders was resistant to the protein synthesis inhibitor cycloheximide, coincided with transfer of a PKH26 lipophilic dye from APC to responders, and resulted in the expression of syngeneic and allogeneic MHC glycoproteins on responders. Unlike rested I-A− T cell clones, rat thymic and splenic T cells expressed readily detectable levels of class II MHC glycoproteins. When preactivated with mitogens, naive T cells acquired APC-derived MHC class II molecules and other membrane-associated proteins when cultured with xenogeneic APC in the absence of Ag. In conclusion, this study provides evidence that APC donate membrane-bound peptide/MHC complexes to Ag-specific T cell responders by a mechanism associated with the induction of tolerance. Experimental autoimmune encephalomyelitis (EAE)3 is widely used as an animal model for the human demyelinating disease multiple sclerosis (1, 2, 3, 4). In Lewis rats, EAE is mediated by polyclonal Th cells specific for overlapping determinants in the immunodominant 72–86 region of myelin basic protein (MBP) (5, 6). Most MBP-reactive T cells exhibit potent reactivity to guinea pig (GP)MBP and substantially lower reactivity to autologous rat (R)MBP even though GPMBP and RMBP differ by only a single amino acid (S80 for T80) in the 72–86 region (7). Relatively rare MBP-reactive T cells, however, express high levels of equipotent reactivity to the 72–86 sequence of either MBP. The potency of T cell responses to autologous RMBP in vitro correlates with encephalitogenic activity in vivo (8). Previous studies have indicated that T cell-mediated Ag presentation constitutes a central pathway of cell-cell communication among rat MBP-reactive T cells (8, 9, 10, 11, 12). When cultured with professional APC in the presence of MBP, MBP-specific T cells express class II MHC glycoproteins and subsequently present Ag to separate populations of responder T cells. The expression of I-A glycoproteins by T cells appears to involve at least two distinct mechanisms. First, blastogenic T cells directly synthesize class II MHC glycoproteins and assemble MHC/peptide complexes for presentation to responder T cells (10, 11, 12). Second, T cells appear to directly acquire preformed class II MHC/peptide complexes from professional APC (11, 12, 13, 14). The latter mechanism may involve APC-mediated release of small vesicles bearing class II MHC glycoproteins and subsequent Ag-specific uptake of such vesicles by responder T cells. Direct support for the latter mechanism stems from the observation that transformed T-APC constitutively release small I-A+ vesicles (12). T-APC pulsed with MBP release vesicles that not only activate MBP-specific responders, but also endow those responders with surface class II MHC glycoproteins and with the ability to present MBP to separate populations of MBP-specific responders. Thus, MHC/peptide complexes may be actively exchanged by a mechanism of intercellular vesicular transport among APC and Ag-specific T cells. T cell-mediated Ag presentation may be central to mechanisms of peripheral tolerance (15). Positive thymic selection produces a mature T cell repertoire that recognizes specific self MHC/peptide complexes as inefficient ligands (i.e., partial agonists). Mature immunocompetent T cells most likely continue to recognize specific self MHC ligands in the periphery as inefficient ligands. Two experimental observations have linked inefficient TCR recognition with prolonged T-APC activity. First, T cell acquisition of class II MHC glycoproteins is driven by partial agonists that lack activity in assays of IL-2 production, proliferation, or induction of B7.1 molecules (9, 16). Second, the duration of class II MHC expression on T cells depends upon subsequent interactions with TCR on the same or neighboring clones (10). T cells that efficiently recognize cell surface class II MHC glycoproteins quickly down-regulate these molecules, whereas inefficient TCR recognition results in prolonged expression and presentation of these complexes. This relationship may explain why enduring T-APC activity is often mediated upon recognition of antagonistic MHC ligands or upon Ag recognition in the presence of tolerogenic anti-CD4 and anti-LFA-1 mAb (8, 9, 10, 11, 16, 17). Thus, the positively selected T cell repertoire may inefficiently recognize and subsequently present self MHC/peptide complexes in a B7-deficient manner to any clone that recognizes the same self peptide/MHC complex as an efficient ligand. The purpose of this study was to identify mechanisms by which T cells acquire class II MHC glycoproteins. Herein, we show that an early activation event following specific MHC/peptide-TCR interactions results in the cell-to-cell transfer of preformed class II MHC ligands from APC to responder T cells. T-APC that actively donate MBP/class II MHC complexes to responder T cells are also able to adoptively transfer resistance to EAE in recipient rats. The transfer of preformed MHC/peptide complexes among Ag-specific T cells may have important implications for the fate of Ag in an adaptive immune response and for maintenance of self-tolerance. Lewis rats (RT-1l), Brown Norway rats (BN, RT-1n), PVG rats (RT-1c), and BALB/c mice (Harlan Sprague-Dawley, Indianapolis, IN) were bred and maintained at East Carolina University School of Medicine (Greenville, NC). MBP was purified from rat or guinea pig spinal cords (Rockland, Gilbertsville, PA). Anti-I-A OX6 and OX3 IgG1 (specific for monomorphic determinant and Lewis polymorphic I-A determinants, respectively), anti-I-E OX17 IgG1 (18, 19), anti-TCRβ-chain R73 IgG1 (20, 21), anti-CD4 W3/25 IgG1 (22), anti-CD4 OX35 IgG2a (23), anti-IL-2R OX39 IgG1 (24), anti-OX40 IgG2b (24, 25), and anti-transferrin receptor OX26 IgG2a (26) were concentrated by ultrafiltration of supernatants through Amicon spiral-wound membranes (100-kDa exclusion). Anti-I-A HIS28 IgG2a, anti-B7.1 3H5 IgG1, and anti-B7.2 24F IgG1 mAb (27) were purchased from PharMingen (San Diego, CA). Cycloheximide, Con A, ionomycin, and PMA were obtained from Sigma. The anti-BN antiserum was derived by repeated immunization of Lewis rats with BN splenocytes. R1-trans, 2F4-trans, 5F3-trans, and PVG-GP-trans T cells are IL-2-dependent, transformed variants of the GP2.E5/R1, R2.2F4, GP2.5F3, and PVG-GP clones, respectively. These T-APC clones constitutively express high levels of class II MHC glycoproteins, B7.1, and B7.2 (11). The mildly encephalitogenic GP2.E5/R1 and GP2.5F3 T cell clones were isolated from Lewis rats sensitized with GPMBP in CFA. The highly encephalitogenic R2 line and the R2.2F4 and R2.2C8 clones were isolated from Lewis rats sensitized with synthetic peptide R72–86 (PQKSQRSQDENPV) in CFA (8, 28). The CONAL.8D9 clone was isolated from Lewis rats sensitized with conalbumin in CFA (9, 10, 11). BN-GP and PVG-GP T cells lines were isolated from BN and PVG rats immunized with GPMBP in CFA. R1-trans, 2F4-trans, 5F3-trans, and PVG-GP-trans T cells were used as T-APC in this study, whereas R2.2C8, R2.2F4, BN-GP, and PVG-GP lines were used as responders. T cell clones were maintained in RPMI medium supplemented with 10% heat-inactivated FBS (Summit, Boulder, CO), 2 mM glutamine, 100 μg/ml streptomycin, 100 U/ml penicillin (Whittaker Bioproducts, Walkersville, MD), 50 μM 2-ME (Sigma), and rat rIL-2. Culture supernatants (0.4%) from Sf9 insect cells infected with a rat rIL-2 baculovirus were used as a source of IL-2. The rat alveolar Mφ NR8383 cell line (29) was obtained from American Type Culture Collection (Manassas, VA). Splenocytes (SPL) as well as thymocytes were used as naive responders and were washed three times in HBSS before use. In assays to measure transfer of class II MHC glycoproteins, T-APC and responders were typically cultured at cell densities of 2.5 × 105/ml each in IL-2-supplemented RPMI. SPL were exposed to 3000 rad of γ-irradiation and were then used as a source of professional APC. Irradiated SPL (irrSPL) and T cell responders were cultured at cell densities of 1.25 × 106/ml and 5 × 105/ml, respectively, unless designated otherwise. 2F4-trans and 5F3-trans T cells were propagated in serum-free AIM medium (Life Technologies) supplemented with rat IL-2 and 50 μM 2-ME. These T cells (2 × 106/ml) were cultured with the combination of 2 μM GPMBP and 2 μM RMBP or with no Ag for 4 h and were injected into naive recipient rats. After 1 wk, recipient and untreated control rats were challenged with an emulsion of 25 μg of GPMBP and 200 μg of heat-killed Mycobacterium tuberculosis H37Rv in CFA. Each rat received two 50-μl injections on each side of the base of the tail. Recipients were scored daily for signs of clinical EAE according to the following scale: paralysis in the distal tail = 0.25, limp tail = 0.5, ataxia = 1, hindleg paresis = 2, full hindleg paresis = 3. The cumulative score was the sum of daily clinical scores for each rat. The mean cumulative severity was the average cumulative score for all rats within a group. The mean maximal intensity was the average maximal score among afflicted rats within a group. 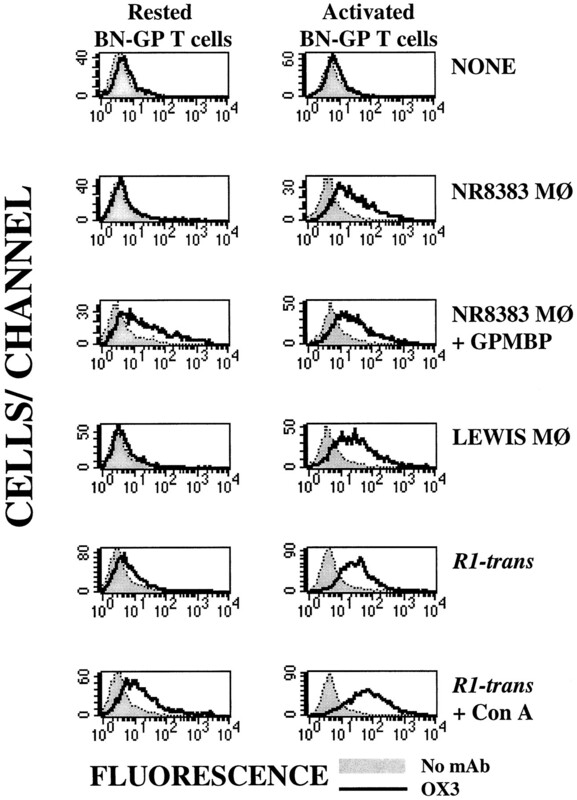 The BN-GP T cell line (2.5 × 104/well) was cultured with designated densities of IFN-γ-induced NR8383 Mφ in complete RPMI medium in the presence or absence of 2 μM GPMBP. After 24 h of a 48-h culture, the cultures were pulsed with 1 μCi of [3H]thymidine (6.7 Ci/mmol; NEN, Boston, MA). T cells were harvested onto filters to measure [3H]thymidine incorporation by scintillation counting. Cells were stained with PKH26 or PKH67 dyes (Sigma, St. Louis, MO), according to manufacturer’s instructions. Washing and incubation of T cells with Ab reagents were performed at 4°C. mAb were added at 2.5 μg/ml or a 1/20 titration of a concentrated supernatant. T cells were incubated for 40 min, washed twice, and incubated for 40 min with a FITC- or PE-conjugated secondary reagent. Dead cells were excluded from analysis by forward vs side scatter profiles. Data were acquired with a Becton Dickinson FACScan (San Jose, CA) flow cytometer and were analyzed with Lysis II and CellQuest software programs. Previous studies have shown that Ag presentation by T-APC induces apoptosis or anergy in responder T cells (8, 30, 31, 32, 33, 34, 35, 36, 37, 38, 39). This study was in part based on the use of transformed, IL-2-dependent T cell clones that constitutively expressed class II MHC glycoproteins. These clones enabled us to compare the tolerogenic activity of T-APC in vivo vs the consequences of T cell-mediated Ag presentation on responders in vitro. 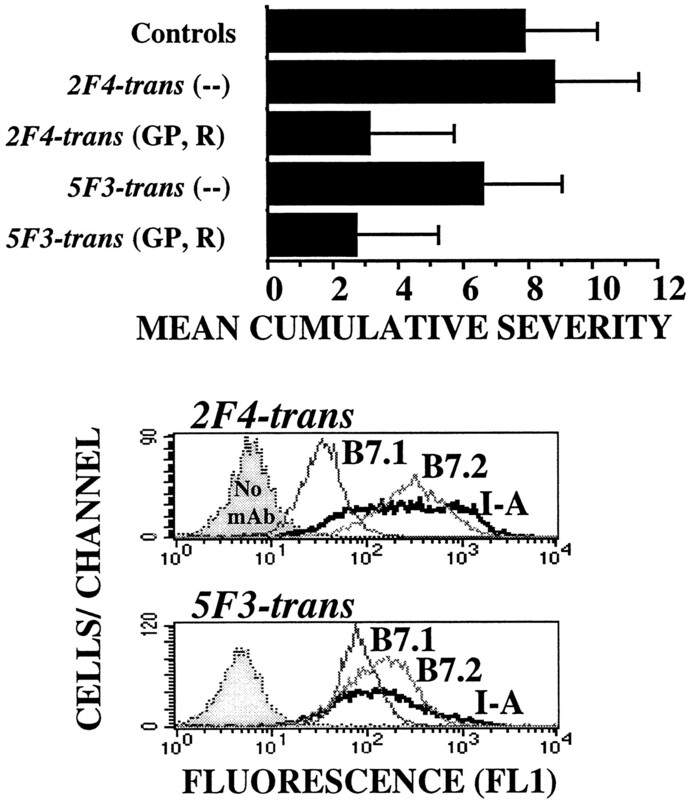 Of these transformed clones, the Vβ4+2F4-trans and Vβ8.2+ 5F3-trans clones grew well in serum-free medium. These clones were pulsed with a combination of GPMBP and RMBP and were transferred into recipients. After 1 wk, rats were challenged with GPMBP in CFA. As shown in Fig. 1⇓, adoptive transfer of these clones resulted in a significant reduction in the severity of EAE. These clones exhibited tolerogenic activity in vivo despite expression of high levels of both B7.1 and B7.2 costimulatory molecules (bottom panels). Only MBP-pulsed T-APC suppressed the subsequent induction of EAE, whereas unpulsed T-APC were without activity. Thus, expression of MBP-derived peptide/I-A complexes on the surface of the T-APC was required for adoptive transfer of tolerogenic activity. The strong tolerogenic activity of the Vβ4+2F4-trans clone and the requirement for class II-restricted presentation of MBP discount a possible role for anti-Vβ8.2 immunity. Overall, these data indicate that expression of self peptide/class II MHC complexes on the cell surface is required for expression of regulatory activity by these clones in vivo. MBP-pulsed T-APC mediate adoptive transfer of tolerance. Top panel, T-APC clones 2F4-trans and 5F3-trans were cultured for at least 2 wk in serum-free AIM medium supplemented with rat IL-2 and 50 μM 2-ME. These T cells were cultured at 2 × 106/ml with the combination of 2 μM GPMBP and 2 μM RMBP (GP, R) or with no Ag for 4 h and were injected into naive recipient rats. After 1 wk, recipient and untreated control rats were challenged with an emulsion of 25 μg of GPMBP in CFA. Mean cumulative scores for recipients of MBP-pulsed T cells (2F4-trans(GP, R) and 5F3-trans(GP, R)) were significantly less than those for recipients of unpulsed T cells or untreated controls, as assessed by one-way ANOVA. Error bars represent SDs. Incidence of EAE (mean maximal intensity) was: untreated controls, 10/10 (2.8); 2F4-trans, 4/4 (3); MBP-pulsed 2F4-trans, 3/4 (1.5); 5F3-trans, 3/3 (2.7); MBP-pulsed 5F3-trans, 4/5 (1.6). The cumulative score was the sum of daily clinical scores for each rat. The mean cumulative severity (x-axis) was the mean of the cumulative scores for all rats within one group. The mean maximal intensity was the average maximal score among afflicted rats within one group. Bottom panel, Surface expression of B7.1, B7.2, and I-A on either cell line was assessed with 3H5, 24F, and OX6 mAb, respectively. T-APC lines such as 2F4-trans, 5F3-trans, and R1-trans constitutively process soluble protein Ags such as MBP or conalbumin and incorporate derivative peptides into class II MHC glycoproteins for presentation to appropriate responder T cells. R1-trans T cells were the focus of subsequent experiments because these T cells expressed the highest levels of I-A. In these experiments, R1-trans T-APC presented MBP to encephalitogenic R2.2C8 responder T cells that were prelabeled with the PKH26 lipophilic dye (Sigma). PKH26 (FL2 fluorescence) is a nonleaching dye that incorporates into the lipid bilayer and enables long-term tracking of specific cell populations (40, 41). The R1-trans T-APC were larger (Fig. 2⇓A) and were PKH26− (lower quadrants of Fig. 2⇓B), and were thus readily distinguished from smaller PKH26+ responders (R1 gate in Fig. 2⇓A and upper quadrants in Fig. 2⇓B). Ag-dependent interactions between R1-trans T-APC and T cell responders result in the rapid acquisition of I-A by responders. R2.2C8 T cell responders were prelabeled with PKH26 lipophilic dye (FL2) and were cultured with R1-trans T-APC for 20 h. GPMBP (2 μM) was or was not added at 0, 16, 18, or 19 h after initiation of culture (20, 4, 2, 1, 0 h of Ag exposure). Cells were subjected to two-color flow-cytometric analysis after staining with OX6 mAb (anti-I-A) and a FITC-conjugated rat anti-mouse secondary. A, Forward vs side scatter profiles distinguished R2.2C8 responders (R1 gate) from the larger blastogenic R1-trans T cells after 4 h, but not after 20 h of Ag exposure. B, Dot plot of all viable cells within the R4 gate (see A) shows the percentages of PHK26+ R2.2C8 T cells vs PKH26−R1-trans T-APC in cultures without GPMBP. This dot plot also shows doublets of R2.2C8/R1-trans T cells in the upper right quadrant. C, Histograms show R2.2C8 T cells that were gated as small (R1 gate) PKH26+ cells that were stained with (bold line) or without (shaded) the OX6 mAb. The R1 gate served to exclude doublets from this analysis. 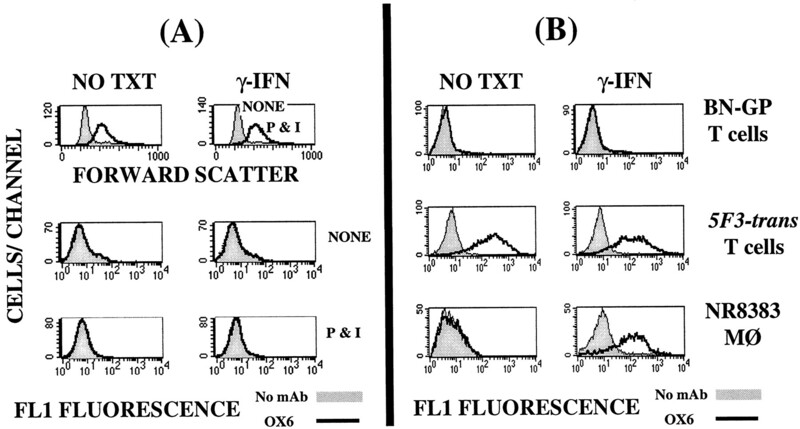 The mean fluorescence intensities of OX6-stained cells are shown in the upper right of each histogram. These data are representative of four experiments. Addition of GPMBP to these cultures elicited the rapid appearance of I-A on responder T cells (Fig. 2⇑C). Significant induction of I-A on responders occurred within 1 h of Ag exposure. High level expression of I-A by responder T cells occurred within 4 h of Ag exposure and preceded blastogenesis of responder T cells (data not shown). The duration of Ag exposure was directly related to the acquisition of I-A on responder T cells. T-APC/responder doublets were PKH26+, had high forward scatter profiles, ranged from 1–4% of the total population (upper right quadrant in Fig. 2⇑B), but were excluded from this analysis by gating on small T cells (defined by R1 gate in Fig. 2⇑A). Blastogenesis of responders occurred within approximately 20 h of Ag exposure, as shown by increased forward scatter (Fig. 2⇑A), and concurred with the widespread disappearance of the T-APC presumably via a mechanism of apoptosis (data not shown). These data reveal that class II MHC glycoproteins were early activation markers on responder T cells. The relatively rapid appearance of I-A on responders provided suggestive evidence that initial appearance of I-A on responders may reflect shedding of I-A from T-APC, followed by Ag-specific capture by responder T cells. To test this possibility, Ag-dependent interactions of unlabeled R1-trans T-APC with PKH67 (FL1)-labeled R2.2F4 responder T cells were analyzed in the presence or absence of the protein synthesis inhibitor cycloheximide (Fig. 3⇓). In the presence of T-APC, GPMBP stimulated expression of I-A on responder T cells (gated by the combination of R1 and R3 regions) by a mechanism that was largely resistant to cycloheximide. In contrast, GPMBP-dependent induction of IL-2R, OX40 receptors, or transferrin receptors (measured by OX39, OX40, and OX26 mAb) was abrogated by cycloheximide (data not shown). Overall, these results implicate R1-trans T-APC as the source of I-A glycoproteins that accumulate on responder T cells. Protein synthesis is not required for Ag-dependent acquisition of I-A by T cell responders. R1-trans T-APC were cultured for 20 h with or without GPMBP to enable incorporation of GPMBP-derived peptides into I-A glycoproteins. R2.2F4 T cell responders were labeled with PKH67 lipophilic dye (FL1) and were cultured with R1-trans T-APC for 4 h in the presence or absence of 10 μg/ml cycloheximide. Cells were subjected to two-color flow-cytometric analysis after staining with the OX6 mAb (anti-I-A) and a PE-conjugated goat anti-mouse secondary. Histograms show R2.2F4 T cells that were gated as small (R1 gate to exclude doublets) PKH67+ cells (defined by R3 gate) that were stained with (bold line) or without (shaded line) the OX6 mAb. 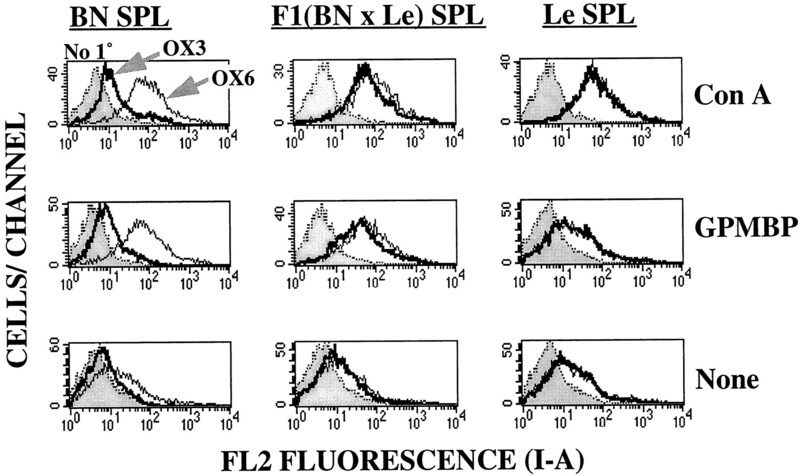 The mean fluorescence intensities of OX6-stained cells are shown in the upper right of each histogram. These data are representative of four experiments. The transfer of MHC class II glycoproteins between T-APC and responder T cells may be mediated by release of class II MHC-bearing vesicles from APC, recognition of vesicular MHC/peptide complexes by responder T cells, up-regulation of adhesion activity, and fusion of vesicles with the T cell surface (12). According to this hypothesis, lipid should also transfer from T-APC to responder T cells together with class II MHC glycoproteins. As shown in Fig. 4⇓, MBP-dependent interaction of PKH26-labeled T-APC with responders resulted in the incorporation of the PKH26 dye into the responder T cells (top panel). The incorporation of PKH26 into responder T cells is revealed by the right shift in the FL2 fluorescence for responder T cells. This mechanism of intercellular membrane exchange resulted in the efficient incorporation of bystander or passenger I-E/peptide complexes (bottom two panels), even though neither T-APC nor responders recognized I-E/peptide complexes. These data support the hypothesis that bystander proteins and membrane are mobilized together with cognate MHC/peptide complexes for transfer to responder T cells during specific recognition of Ag. Ag-dependent T-T cell transfer of a lipophilic PKH26 dye and bystander I-E glycoproteins. R1-trans T cells were labeled with PKH26, were cultured with or without GPMBP for 24 h, were thoroughly washed, and were cultured with R2.2F4 responders for 16 h. Top panel, R2.2F4 T cells cultured alone or R2.2F4 T cells cultured with either MBP-pulsed or unpulsed R1-trans T cells were analyzed for expression of the PKH26 dye. Note that doublets comprised of PKH26+ and PKH26− cells would be PKH26bright, and thereby did not account for the right shift of the PKH26low population in the presence of Ag. Bottom two panels, After culture with MBP-pulsed R1-trans T cells (middle panel) or unpulsed R1-trans T cells (bottom panel), responder T cells were stained with (bold) or without (shaded) an anti-I-E mAb (OX17) and a FITC-conjugated rat anti-mouse secondary reagent. Viable PKH26− T cells were gated and analyzed for I-E expression. These data are representative of four experiments. The research described above revealed that TCR initiated acquisition of class II MHC/peptide complexes by T cell responders. However, the question remained whether TCR engagement and consequent T cell activation facilitated uptake of vesicular class II MHC or whether TCR enhanced the release of APC-derived vesicles, followed by nonspecific acquisition of class II MHC by bystander T cells. To address this question, unlabeled R1-trans T-APC were cultured with PKH26-labeled R2.2C8 responders and a biotin-labeled conalbumin-specific CONAL.8D9 bystander clone. As shown in Fig. 5⇓, R1-trans T cells presented MBP to cause activation of R2.2C8 T cells, as indicated by acquisition of class II MHC glycoproteins and expression of costimulatory molecules B7.1, B7.2, and OX40. In contrast, bystander CONAL.8D9 T cells in the same culture did not exhibit an altered phenotype. However, when R1-trans, R2.2C8, and CONAL.8D9 T cells were cultured with conalbumin rather than RMBP, CONAL.8D9 but not R2.2C8 T cells expressed an activated class II MHC+ phenotype (data not shown). The observation that unactivated T cells did not acquire I-A supports the possibility that TCR ligation, T cell activation, or both may be required for the acquisition of MHC class II glycoproteins. During Ag-dependent interactions with T-APC, responder T cells, but not nonspecific bystander T cells, acquire a T-APC phenotype. Responder R2.2C8 T cells were labeled with PKH26, and conalbumin-specific CONAL.8D9 T cells were labeled with NHS-biotin (Pierce, Rockford, IL). R1-trans T cells, PKH26-labeled R2.2C8, and biotinylated CONAL.8D9 T cells were cultured in the presence (bold line) or absence (shaded line) of RMBP for 24 h. The cells were washed and labeled with primary mAb against I-A (OX6), I-E (OX17), B7.1 (3H5), B7.2 (24F), and OX40, and then a FITC-conjugated rat anti-mouse IgG(H+L) together with streptavidin-Red670 (Life Technologies). Three-color analysis was used to measure mAb staining (FL1) of responder R2.2C8 (FL2) and bystander CONAL.8D9 (FL3) T cells. The data described above strongly indicate that Th cells such as transformed T-APC constitutively synthesize class II MHC molecules, whereas responder T cells appear to directly acquire intact MHC class II molecules from APC. To further resolve mechanisms of synthesis vs acquisition in responder T cells, we tested whether Ag-specific interactions of T cell responders and APC resulted in intercellular transfer of allogeneic MHC class II glycoproteins from APC to responder T cells. For this purpose, GPMBP-specific T cell lines were derived from BN or PVG rat strains (BN-GP and PVG-GP lines, respectively) to serve as responder T cells. BN-GP T cells and PVG-GP T cells were restricted by RT-1n and RT-1c class II MHC molecules, respectively (data not shown). Detection of allogeneic MHC class II glycoproteins depended on the use of the OX6 and OX3 mAb. The OX6 mAb recognizes a common monomorphic I-A determinant, whereas the OX3 mAb recognizes a polymorphic determinant uniquely expressed on Lewis, but not on BN or PVG APC. The OX6 mAb inhibited MBP-specific responses by Lewis and PVG T cell lines, but not by BN-GP T cells (data not shown). The OX3 mAb inhibited MBP-specific responses by Lewis T cell lines, but not by either PVG or BN T cell lines (data not shown). Thus, Lewis and PVG-GP T cells were restricted by different polymorphic class II I-A glycoproteins, whereas BN-GP T cells required a different class II MHC glycoprotein for Ag recognition. To address whether class II MHC glycoproteins are acquired or synthesized by responders, BN-GP T cells were labeled with PKH67 and were cultured with irradiated BN, F1(BN × Lewis), or Lewis SPL for 2 days in the presence or absence of GPMBP or Con A. As shown in Fig. 6⇓, BN-GP T cells expressed high levels of I-A when activated by Ag or mitogen in the presence of syngeneic APC, as revealed by high levels of staining with OX6, but not OX3 (left panels). In contrast, BN-GP T cells activated in the presence of F1 APC (middle panels) or fully allogeneic Lewis APC (right panels) expressed high levels of surface I-A, as revealed by staining with both OX6 and OX3 mAb. Thus, mitogenic or antigenic activation of BN-GP T cells resulted in the intercellular transfer of allogeneic Lewis I-A molecules from professional APC to responder BN-GP T cells. PVG-GP T cells that were stimulated with GPMBP or Con A in the presence of F1(PVG × Lewis) SPL or Lewis SPL also efficiently acquired Lewis allogeneic MHC glycoproteins (data not shown). These data indicate that acquisition of APC-derived class II MHC glycoproteins rather than endogenous synthesis represents a major pathway for generation of class II MHC molecules on responder T cells. Furthermore, the mitogen Con A was as effective as GPMBP in catalyzing the transfer of allogeneic MHC complexes from APC to responder T cells. Thus, cellular activation rather than TCR ligation per se was required for efficient acquisition of MHC class II glycoproteins. Mitogenic activation enables incorporation of allogeneic class II MHC glycoproteins on responder T cells. BN-GP responder T cells were labeled with PKH67 (FL1) and then were cultured with BN irrSPL, F1(BN × Lewis) irrSPL, or Lewis irrSPL with or without 2 μM GPMBP or 2.5 μg/ml Con A for 2 days. 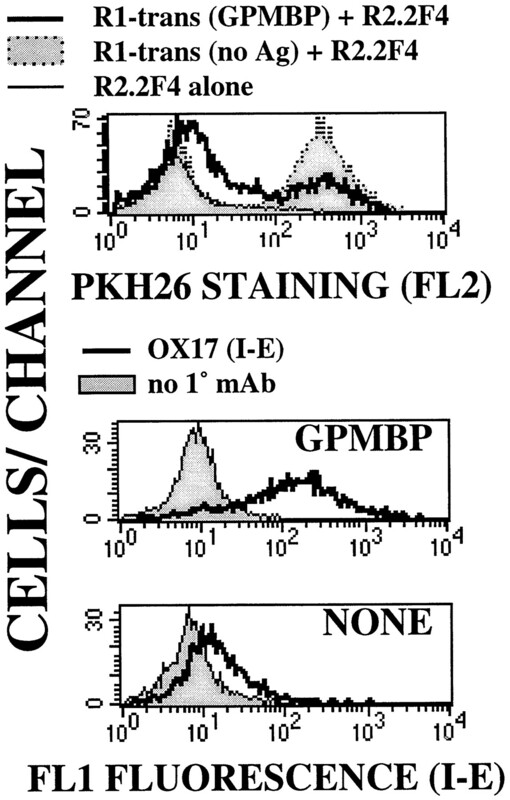 Histograms show PKH67+ BN-GP T cells that were stained with no primary mAb (shaded line), OX3 (bold line), or OX6 (thin line), and a PE-conjugated secondary. These data are representative of four experiments. Most likely, the intercellular transfer of allogeneic MHC class II glycoproteins occurs via APC-derived vesicles that interact with the cell surface of the responder T cell. These vesicles may dock via adhesion-guided mechanisms and would predictably fuse with the cell surface. To determine whether allogeneic MHC class II glycoproteins were tightly or loosely associated with the responder cell surface, T cells bearing allogeneic MHC molecules were treated for 15 min at pH 3.5 and were then extensively washed in HBSS. Acid treatment was intended to reverse noncovalent interactions and cause dissociation of nonintegral membrane proteins. However, acid treatment had no effect on T cell expression of allogeneic MHC molecules (data not shown). This observation indicates that allogeneic MHC molecules were firmly associated with the T cell surface membrane. Although acquisition of I-A from APC may represent a major source of I-A on responder T cells, direct biosynthesis of I-A may also contribute to the accumulation of I-A on responder T cells. To assess the possible role of activation-dependent synthesis of class II MHC, responder T cells were activated in the absence of APC. Responder T cells were cultured for 1 to 3 days with mitogenic mAb (data not shown) or with PMA and ionomycin (Fig. 7⇓). 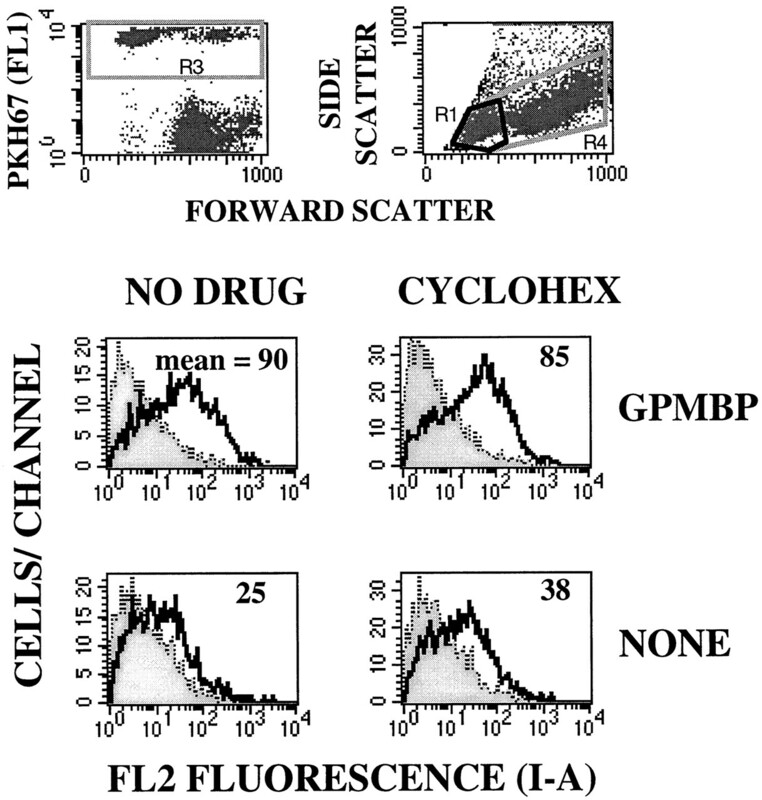 Despite extensive blastogenesis, as shown by forward scatter profiles (top two panels, Fig. 7⇓A), responder R2 T cells did not exhibit I-A expression even when cultured in the presence of IFN-γ (bottom four histograms). Several additional activated and rested responder T cells including BN-GP T cells (Fig. 7⇓B) were cultured with IFN-γ, but none of these T cells exhibited surface I-A. 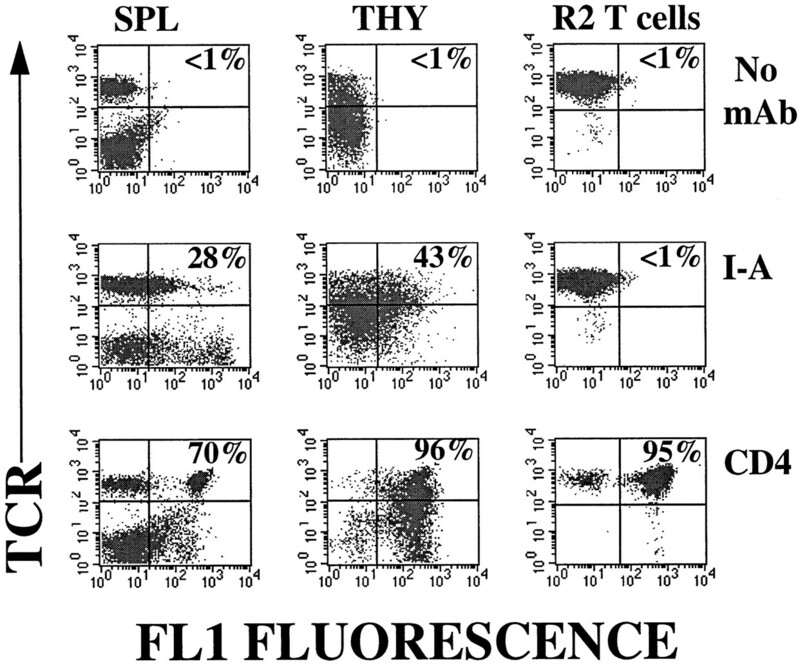 Also, IFN-γ did not elevate expression of I-A on 5F3-trans T cells (Fig. 7⇓B) or several other transformed T-APC lines (data not shown), even though this cytokine elicited expression of I-A on the NR8383 line of rat alveolar Mφ. These data suggest that synthesis of I-A glycoproteins by Th cells is governed by a unique regulatory strategy. IFN-γ induces class II MHC expression on NR8383 Mφ, but not on either rested or activated T cells. A, The polyclonal line of MBP-specific R2 T cells was cultured for 3 days with or without the combination of 100 nM PMA and 2 μM ionomycin (P & I) in the presence or absence of 1000 U/ml of rat IFN-γ. Top two histograms show forward scatter profiles of R2 T cells cultured in the presence (bold lines) or absence (shaded) of PMA and ionomycin. 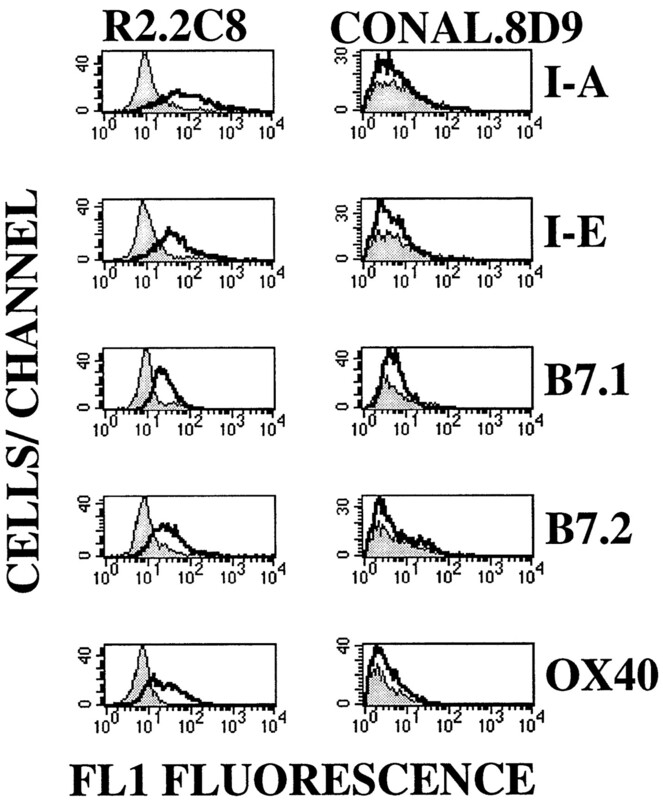 Bottom four histograms show R2 T cells stained with (bold lines) or without (shaded) the OX6 mAb. B, Polyclonal BN-GP T cells, 5F3-trans T cells, or NR8383 Mφ were cultured for 2 days in the presence or absence of IFN-γ and were stained with (bold lines) or without (shaded) the OX6 mAb. These data are representative of four experiments. The studies described above showed that Ag presentation by either T-APC or irrSPL caused the accumulation of I-A on responder T cells. Interpretation of these data was complicated due to extensive cell death of T-APC and the heterogeneity of splenic APC. To address these issues, we used the NR8383 rat Mφ cell line to determine whether nonapoptotic Mφ-APC donate I-A molecules to responder T cells during Ag-induced activation. The NR8383 Mφ line was derived from an outbred Sprague Dawley rat (29) and did not express class II MHC glycoproteins. However, when induced with IFN-γ, NR8383 Mφ expressed I-A glycoproteins that were detected equally by the OX6 and OX3 mAb (Fig. 8⇓). The OX3 mAb also labeled I-A on the Lewis-derived R1-trans T cells, but did not bind I-A molecules that were present on the PVG-GP-trans clone. We screened IFN-γ-induced NR8383 Mφ for APC activity on several responder T cell lines and found that these Mφ presented MBP to BN-GP T cells (Fig. 8⇓). These Mφ also presented conalbumin to a conalbumin-specific BN T cell line, but did not present Ag to MBP-specific or conalbumin-specific PVG or Lewis T cell lines (data not shown). Despite histocompatibility with BN Ag presentation activity, IFN-γ-induced NR8383 Mφ did not react with a Lewis anti-BN alloantiserum (data not shown). Hence, these Mφ express class II MHC glycoproteins homologous to that of BN rats, despite substantial differences in MHC allotypes. IFN-γ-induced NR8383 Mφ express a distinct set of MHC markers and present Ag to BN-derived T cells. 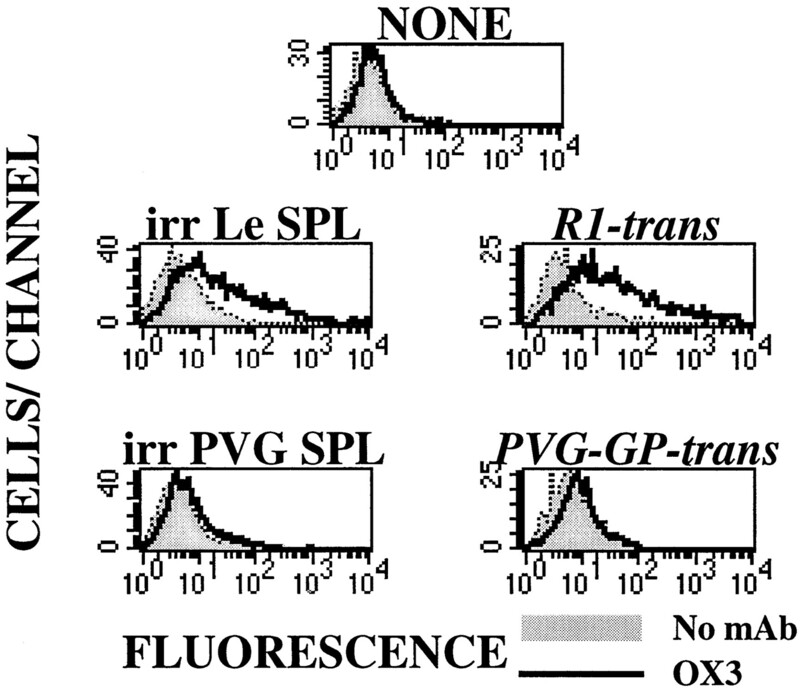 Top three histograms, R1-trans T cells, PVG-GP-trans T cells, or IFN-γ-induced NR8383 Mφ were stained with OX6, OX3, or no primary. Bottom panel, BN-GP T cells (25,000/well) were cultured with designated densities of IFN-γ-induced irradiated Mφ (x-axis) in the presence or absence of 2 μM GPMBP for 2 days. These data are representative of three experiments. A central question concerns the role of TCR in the mechanism of I-A acquisition. One possibility is that the TCR is required throughout the process of I-A acquisition to guide docking and fusion of APC-derived vesicles. A second possibility is that TCR is required solely to elicit cellular activation, and thereby induce adhesion molecules that then independently mediate acquisition of I-A. The latter hypothesis predicts that mitogenically activated I-A− responders would acquire I-A directly from APC without regard to Ag specificity. The observation that Con A induced the acquisition of I-A from allogeneic SPL supports the latter mechanism (Fig. 6⇑). To more fully address these issues, we cultured BN-GP T cells in the presence or absence of PMA + ionomycin to generate activated or rested I-A− responders. These T cells were then cultured in the presence or absence of IFN-γ-induced NR8383 Mφ, peritoneal Lewis rat Mφ, or R1-trans T cells. Within 4 h of culture (Fig. 9⇓), mitogen-activated but not rested BN-GP T cells acquired allogeneic I-A from NR8383 Mφ, Lewis Mφ, or R1-trans T-APC. In these cultures, mitogen-activated T cells did not impair the viability of either Mφ or T-APC (data not shown). Rested BN-GP T cells also acquired allogeneic I-A from Mφ, but only when cultured with an appropriate stimulus such as MBP or Con A (Fig. 9⇓). BN-GP T cells acquired allogeneic I-A from R1-trans T cells in proportion with the degree of mitogenic activation. Ag or mitogen-activated BN-GP T cells acquire allogeneic MHC class II from either Mφ APC or T-APC. NR8383 Mφ were cultured for 5 days with 1000 U/ml IFN-γ, whereas BN-GP T cells were cultured for 2 days with (right histograms) or without (left histograms) 100 nM PMA and 2 μM ionomycin. These BN-GP T cells (3 × 105/ml) were then washed and were cultured for 4 h with no APC, with IFN-γ-induced NR8383 Mφ (105/ml) in the presence or absence of 5 μM GPMBP, with peritoneal Lewis rat Mφ (2 × 105/ml), or with PKH26-labeled R1-trans T cells (5 × 105/ml) in the presence or absence of 2.5 μg/ml Con A. BN-GP T cells were readily distinguished from Mφ by forward vs side scatter profiles. Histograms show BN-GP T cells stained with (bold lines) or without (shaded) OX3 mAb. These data are representative of four experiments. These data support the following conclusions: responder T cells directly acquire intact class II MHC glycoproteins directly from a diversity of APC types including T-APC and Mφ-APC. The role of TCR is required for induction of an activated phenotype, but thereafter is dispensable for the process of I-A acquisition. Intercellular transfer of I-A from APC to T cell responders is not dependent upon apoptosis of APC. Intercellular transfer of MHC class II glycoproteins may lead to relatively high accumulations of I-A on the surface of responder T cells. The studies described above were performed with lines of Th cells that were continuously propagated in IL-2. A question central to the relevance of these observations is whether continuously propagated lines of Th cells reflect normal physiological function of Th cells in general. To test this question, we isolated thymocytes and splenocytes and performed two-color flow-cytometric analyses to assess whether TCRhigh lymphocytes expressed surface I-A glycoproteins (Fig. 10⇓). Substantial proportions of both TCRhigh splenocytes and thymocytes (28% and 43% of cells in upper two quadrants of each dot plot, respectively) expressed surface I-A. Thus, normal rat T cells express I-A glycoproteins at levels similar to that observed for Th cell lines cultured with APC and Ag (e.g., Fig. 9⇑). In contrast, rested R2 T cells did not express surface I-A (Fig. 10⇓). These experiments also showed that class II MHC expression on T cells in vivo was remarkably consistent regardless of age, gender, or strain (Lewis, PVG, or BN) (data not shown). I-A on splenic and thymic T cells was also detected with either the HIS28 mAb (Fig. 10⇓) or the OX6 mAb (data not shown). These data support the concept that class II MHC expression on T cells may be important in T cell physiology. Splenic and thymic T cells express class II MHC glycoproteins in vivo. SPL and thymocytes were isolated from a 1-mo-old female Lewis rat. These cells and R2 polyclonal T cells were stained with the R73 IgG1 mAb and a PE-conjugated goat anti-mouse IgG1 secondary together with no mAb (anti-TCR), HIS28 IgG2a mAb (anti-I-A), or OX35 IgG2a mAb (anti-CD4), and a FITC-conjugated goat anti-mouse IgG2a secondary. The percentages of TCRbright T cells in the upper right quadrant of each dot plot are relative to the total number in the top two quadrants. These data are representative of four experiments. To determine whether normal T cells have the capacity to acquire allogeneic I-A molecules, we cultured mitogen-activated PVG splenic T cells with either syngeneic or allogeneic APC (Fig. 11⇓). Preactivated splenic PVG T cells acquired Lewis I-A molecules when cultured with either irradiated Lewis SPL or R1-trans T-APC, but not when cultured with syngeneic PVG SPL or PVG-GP-trans T-APC. Overall, these data indicate that continuous T cell lines are appropriate models to study T cell acquisition of MHC class II glycoproteins. Splenic T cells acquire MHC class II molecules from allogeneic SPL. Splenic T cells were isolated from a PVG rat by centrifugation on a discontinuous gradient of Ficoll-Hypaque and a 40%/70% step gradient of Percoll. The cell preparation was further depleted of adherent cells by a 2-h incubation at 37°C in a Sephadex G10 column. These PVG splenic T cells were then cultured for 3 days in IL-2 with 100 nM PMA and 2 μM ionomycin. These PVG splenic T cells were labeled with PKH26 and were cultured (2.5 × 105/ml) with irradiated Lewis or PVG SPL (2.5 × 106/ml) or with R1-trans or PVG-GP-trans T cells (2.5 × 105/ml) for 1 day. Histograms show PVG splenic T cells stained with (bold lines) or without (shaded) OX3 mAb. These data are representative of four experiments. The protein-protein or protein-lipid interactions that mediate intercellular exchange of MHC class II glycoproteins may be either species specific or may possibly be highly conserved among species. As shown in Fig. 12⇓, R1-trans T-APC also efficiently donated MHC class II glycoproteins to preactivated BALB/c thymocytes. Hence, neither allogeneic nor xenogeneic barriers prevented exchange of I-A glycoproteins. Consistent with our previous findings, the transfer of rat I-A molecules across the xenogeneic barrier was strongly enhanced by mitogenic preactivation of BALB/c thymocytes. Even among BALB/c thymocytes not exposed to mitogen, a proportion of BALB/c thymocytes nonetheless exhibited blastogenesis when cultured with R1-trans T-APC during the 1-day culture. In these cultures, the magnitude of forward scatter was a direct correlate of I-A acquisition (data not shown). Overall, these data indicate that highly conserved mechanisms mediate the activation-dependent exchange of cell surface proteins among T cells. Intercellular transfer of MHC class II glycoproteins: lack of species restriction and requirement for viable APC and responders. A, BALB/c thymocytes (Thy) from a 1-mo female were cultured for 4 days in the presence (right panels) or absence (left panels) of 100 nM PMA + 2 μM ionomycin. These cells were washed and cultured (5 × 105 cells/ml) with PKH26 (FL2)-labeled R1-trans T cells (5 × 105 cells/ml) for 1 day. Histograms show BALB/c thymocytes (solid lines) or R1-trans T cells (bold lines) stained with W3/25 (anti-CD4), OX39 (anti-IL-2R), or OX3 (anti-I-A) anti-rat mAb. The shaded histograms show staining of BALB/c thymocytes that were cultured without a primary mAb. These data are representative of five experiments. B, R2 T cells were cultured for 1 day with 100 nM PMA + 2 μM ionomycin. Preactivated R2 T cells or PKH26-labeled R1-trans T cells were or were not fixed for 2 h with 4% paraformaldehyde and 0.1% glutaraldehyde. 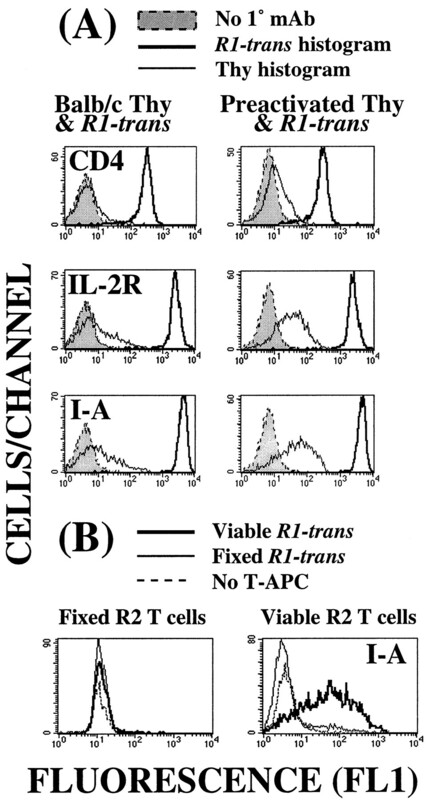 Histograms show either fixed (left panel) or viable (right panel) R2 T cells that were cultured with fixed (solid lines) or viable (bold lines) R1-trans T-APC before staining with the OX6 mAb. R2 T cells cultured without T-APC are designated by dashed lines. The mean fluorescent intensity of background vs OX6-stained viable R1-trans T cells (5 and 1736) was similar to that for fixed nonviable R1-trans T cells (24 and 2056), respectively. These data are representative of two experiments. The activation-dependent transfer of I-A between R1-trans T cells and preactivated BALB/c thymocytes also enabled analysis of whether particular restricted subsets of transmembrane proteins are exchanged between APC and T cells. Activation markers such as the rat IL-2R accumulated on preactivated BALB/c T cells at levels proportional to the respective expression on R1-trans T-APC (Fig. 12⇑). These observations document the activation-dependent exchange of membrane between APC and responders, but do not support the selective segregation and transport of I-A glycoproteins per se. Overall, other surface markers appear to accumulate on activated T cells in proportion to the quantity present on donor APC. The mechanism of intercellular exchange of cell surface proteins most likely requires cytoskeletal reorganization and membrane mobility for generation of vesicles or membrane evaginations. To test this generalized prediction, we treated either T-APC or preactivated responders with fixative before culture. As shown in Fig. 12⇑, fixation of either T-APC or responders completely abrogated exchange of MHC class II glycoproteins. Thus, the physiological integrity of both APC and responders is required for exchange of cell surface proteins. In conclusion, these studies provide evidence that T cell Ag recognition coupled with T cell activation are events causally linked with T cell acquisition of APC-derived class II/peptide complexes. Given that TCR is the major physiological avenue of T cell activation in vivo, cognate MHC/peptide presented by APC are mobilized and actively exchanged among activated, Ag-specific networks of T cells. These data therefore introduce an important new paradigm for communication of Ag-specific information during the course of an immune response. During activation, naive T cells, T cell clones, and T cell lines from mice (13, 42, 43, 44, 45, 46, 47, 48, 49, 50, 51), rats (8, 9, 10, 11, 52, 53, 54, 55, 56, 57, 58), and humans (14, 30, 31, 32, 33, 34, 35, 36, 37, 38, 59, 60, 61, 62, 63, 64, 65) express class II MHC glycoproteins. This study indicates that intercellular transfer of APC-derived class II MHC glycoproteins represents a major source of the MHC class II glycoproteins that accumulate on responder T cells during cellular activation. Accumulation of MHC class II molecules on responder T cells occurred despite blockade of protein synthesis by cycloheximide. APC-T cell interactions also resulted in the transfer of an APC-derived lipophilic dye, bystander I-E complexes, both allogeneic and xenogeneic MHC class II glycoproteins, and other activation markers such as IL-2R to responder T cells. Previous studies have indicated that T cell acquisition of class II MHC glycoproteins results in T cell-mediated presentation of both cognate and bystander Ags to appropriate responder T cells (10, 11). Previous studies have also indicated that APC shed MHC class II glycoproteins that are acquired by T cells (13, 14). APC-derived vesicles represent a possible vehicle for intercellular transfer of class II MHC glycoproteins and other APC-derived molecules from APC to T cells. For example, APC may produce class II MHC-bearing vesicles (i.e., exosomes) derived from the MHC class II endocytic compartment (66, 67). Exosomes form upon invagination of the limiting MHC class II endocytic compartment vesicular membrane and result in a multivesicular compartment comprised of smaller vesicles within a larger vesicle. Upon fusion with the surface membrane, exosomes may be released into the extracellular space and may be captured via fusion with T cells bearing appropriate clonotypic TCR. Alternatively, the APC surface membrane may vesiculate in the contact zone between opposing APC-T cell conjugates. Class II MHC-bearing vesicles may thereby be released within the zone between APC and responders to augment specific acquisition by cognate responders. The mechanism for I-A acquisition appears to involve a TCR-dependent phase and a subsequent TCR-independent phase. First, antigenic ligation of the TCR induces T cell activation to enable the T cell to become a competent recipient of APC-derived vesicles. These activation pathways do not require protein synthesis, and therefore may be mediated by conformational activation or mobilization of preexisting adhesion molecules. Mitogens such as PMA and ionomycin that bypass TCR also enabled T cell-mediated acquisition of allogeneic and xenogeneic I-A from APC. Thus, TCR ligation was required for T cell activation, but thereafter was not required for the subsequent physical acquisition of APC-derived I-A molecules. These observations indicate that other specialized proteins may exist to mediate docking and fusion of APC-derived vesicles. The mechanism by which APC elaborate I-A-bearing vesicles may also be an activation-dependent process. R1-trans T-APC are transformed activated blast cells that constitutively produced I-A+ vesicles (12). However, normal APC may require feedback activation from specific responder T cells to induce production and directional release of vesicles. When isolated from MBP-pulsed R1-trans T-APC, these vesicles stimulated proliferation of responder T cells, conferred cycloheximide-resistant acquisition of I-A by responders, and enabled responders to present MBP to other MBP-specific responder T cells. The correlation between death of R1-trans T-APC and intercellular transfer of I-A to responder T cells provided suggestive evidence that apoptotic bodies may also serve as a vehicle for the transfer of I-A from APC to responder T cells. For example, apoptosis of APC results in the release of Ag-bearing apoptotic bodies that are taken up by dendritic cells for representation of Ag (68). Although apoptosis may possibly mediate one mechanism for the transfer of intact MHC/peptide complexes to responder T cells, a requirement of APC apoptosis is unlikely because I-A acquisition by T cell responders preceded detection of apoptosis of T-APC. Also, T-APC did not exhibit cell death during interactions with mitogenically preactivated responders, and Mφ APC did not die during antigenic stimulation of responders. Future studies are needed to resolve whether apoptosis constitutes a source of I-A for intercellular transfer of class II MHC glycoproteins. Several studies have indicated that TCR ligation plays a central role in the generation of T-APC phenotype (8, 9, 10, 11). Acquisition of intact class II MHC complexes from APC and biosynthesis of class II MHC complexes by T cells represent two Ag-dependent mechanisms that both couple TCR recognition with T cell expression of class II MHC glycoproteins loaded with both specific and bystander peptides. Both pathways enable Th cells, like B cells, to use cognate receptor specificity to guide the specificity of Ag presentation. B cells use surface Ab to capture and internalize specific Ag into the endocytic Ag-processing pathway. The consequence is that surface Ab receptors constrain the pool of Ags available for subsequent B cell-mediated Ag presentation so that B cells preferentially present Ags that are covalently linked to the cognate Ag (69, 70, 71). By this mechanism, B cell APC typically present covalently linked determinants to T cells to promote cooperation between B cells and T cells that share specificity for the same Ag. The coupling of B cell Ab specificity with the specificity of Ag presentation is of fundamental importance to the physiology of humoral immune responses. The data presented herein indicate that T cells like B cells comprise a cognate system of APC. The finding that TCR regulates acquisition of class II MHC glycoproteins indicates that T-APC and T cell responders share specificity for specific or bystander Ags derived from the same APC. The finding that class II MHC glycoproteins mediate intercellular transport of peptide Ag may reflect an unrealized but important function of these molecules. Packaging of antigenic peptides in complexes with MHC glycoproteins followed by intercellular transfer may represent a means by which Ag may flow through a population of lymphoid cells. Ag may be processed and assembled into class II MHC glycoproteins by professional APC such as Mφ, dendritic cells, and B cells, and then may be acquired by Th cells. Th cells that acquire MHC/peptide complexes may in turn present these complexes to other responder T cells. By such a mechanism, Ag may become concentrated on T cells having highest reactivity to that Ag. Such a mechanism would greatly enable interactions of MHC/peptide complexes with specific T cells where such interactions may facilitate immunity or tolerance depending upon the regulated expression of costimulatory molecules on T cells. The finding that Mφ APC and T-APC provide MHC class II glycoproteins for ultimate expression on specific responder T cells may be important for understanding mechanisms of self-tolerance. Previously, we showed that the activated Vβ4+ R2.2F4 clone caused an episode of EAE that was followed by the development of resistance to EAE (28). Although 2F4-trans T cells are a derivative of the R2.2F4 clone, 2F4-trans T cells exhibited no detectable pathogenic activity. Nonetheless, when pulsed with MBP and transferred into naive recipients, these T cells were able to effectively engender resistance to the subsequent induction of EAE. Hence, the tolerogenic activity of R2.2F4 does not strictly depend upon the previous expression of EAE, but rather represents an activity that can be mediated independently of pathogenicity. The data shown in Fig. 1⇑ implicate a mechanism of T cell-mediated Ag presentation in development of resistance to EAE because MBP-pulsed T-APC expressed tolerogenic activity, whereas unpulsed T-APC exhibited no activity. Overall, this study shows that in vivo expression of tolerogenic activity is correlated with the intercellular transfer of MBP-peptide-derived I-A complexes. Possibly, the ability of MBP-pulsed T-APC to specifically donate MBP-peptide/I-A complexes to endogenous MBP-specific responders may be important for disabling encephalitogenic precursors in vivo. Positive thymic selection generates a mature T cell repertoire that inefficiently recognizes specific self MHC ligands. T cell recognition of self may result in the transfer of MHC class II glycoproteins from APC to specific responders by mechanisms described in this study. This possibility is supported by the observation that both splenic and thymic rat T cells express surface I-A glycoproteins (Fig. 10⇑). Inefficient recognition of self MHC ligands appears sufficient to enable acquisition of MHC class II glycoproteins by mature T cells, but would be coupled with a lack of overt T cell activation and deficient expression of costimulatory molecules (16). Thus, inefficient recognition of self by the positively selected T cell repertoire would result in T cell-mediated presentation of those self MHC/peptide complexes to any autoreactive responder with pathogenic self-reactivity (15). The ability of T-APC to generate anergy and apoptosis in responder T cells and mediate adoptive transfer of suppressive activity supports a potential role for T-APC activity in self-tolerance. In conclusion, this study may have relevance for understanding the function of MHC class II glycoproteins. MHC class II/peptide complexes can no longer be conceptualized as static fixtures on APC. Rather, these molecules are mobilized from cell to cell during immune responses as part of an undefined regulatory program. ↵1 This study was supported by a research grant from the National Multiple Sclerosis Society. ↵3 Abbreviations used in this paper: EAE, experimental autoimmune encephalomyelitis; BN, Brown Norway; GP, guinea pig; irrSPL, irradiated SPL; Mφ, macrophage; MBP, myelin basic protein; R, rat; SPL, splenocyte.